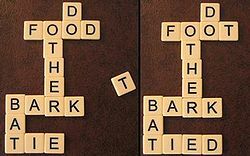 Bananagrams is a word game invented by Abraham Nathanson of Pawtucket, Rhode Island, wherein lettered tiles are used to spell words. Nathanson conceived and developed the idea for the game with the help of his family. The name is derived from the founding family's claim that it's the "anagram game that will drive you bananas!" Beginning as a family innovation, Bananagrams was made available to the public in January 2006 at the London Toy Fair. The game is similar to the older Scrabble variant Take Two. Game play involves arranging one's tiles into a grid of connected words faster than one's opponents. The object of the game is to be the first to complete a word grid after the pool of tiles has been exhausted. The tiles come in a fabric, banana-shaped package. Bananagrams is listed as a must-have and one of the top ten best travel games, and it has been listed as a best-seller among toy and gift retailers. An arranged word grid with a newly-drawn tile, "T" (left). In order to fit the "T" in, the "D" at the end of "F O O D" can be moved to another position at which it spells a valid word, yet where "T" would not spell a word, so that "T" can take "D"'s current position (right). The game consists of 144 lettered tiles that are placed face down on the playing surface. The same number of tiles are drawn by each player, and at any player's call of "Split! ", all players turn over their tiles to reveal the lettered sides. Each player begins arranging the letters to form words, which must be connected in intersecting or interlocking manner (i.e. word-tiles are not isolated, at least not before the first "Peel!"). When a player uses up all of their tiles, they call out "Peel!," and each player must draw a new tile from the pool of remaining tiles, called the "bunch." The name "Bananagrams" is a play on the word anagrams, as one must often rearrange the words one has already formed in order to allow newly-drawn tiles to be placed into one's grid. If at any time during play, a player has a letter or letters that he or she does not wish to fit into their word arrangement, that player can announce "Dump!" and exchange any letter for three tiles from the "bunch". Play continues with players announcing "Peel!" when they again fit all their tiles into their crossword-style word arrangements until there are not enough remaining tiles in the "bunch" for all players to take one; at this point, the first player to have placed all of his or her tiles into their word grid calls out "Bananas!" and is declared the winner if all of their words are valid upon inspection. Bananagrams uses elements of both Boggle and Scrabble. It is similar to Boggle in the sense that game play is simultaneous, yet players build interlocking puzzles similar to those in Scrabble. 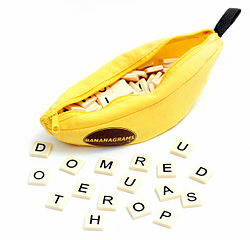 Because Bananagrams can be played by players at any (English) reading level, the game is useful for children who are learning to spell, and has been touted as both educational and popular among consumers. An independent psychologist reviewed Bananagrams and expressed her recommendation of Bananagrams as a positive example of creativity stimulation because, perhaps unlike Scrabble, the goal is to play all of one's tiles, which generates a need to configure and reconfigure one's word grid to accept all of the letters. Other tabletop word games that are played without a board include Anagrams, Dabble, Perquackey, Puzzlage, Quiddler, Scrabble Apple, and Scrabble Slam. Bananagrams is also similar to Syzygy, a letter-tile game released in 1997, and Double Quick. An online version of Bananagrams was developed by Large Animal Games, in partnership with Majesco Entertainment. It ran from 2008 until 2012. The online version adhered to the same protocol as the tabletop edition, but certain game play adjustments and social features were also available. Players could play live games or send challenges to friends, and share completed games with one another. The game also included solitaire modes and "Banana Café", where the objective was to beat one’s own best time. The online game version offered players the opportunity to customize the game with "Banana Chip" credits. Banana Chips were earned by playing games and by issuing and winning challenges. They could be spent in the virtual store to purchase new tiles and playing boards, and to buy in-game hints and bonuses to gain an advantage over other players. Multi-tier achievements were also awarded to players in recognition of outstanding skill, and a leaderboard contained information pertaining to other players. Bananagrams also publishes the games Appletters, Fruitominoes, Linkee, Pairsinpears, and Zip-It.